OSWEGO, NY – Mayor Randolph F. Bateman is pleased to announce the appointment of Police Captain Tory L. DeCaire as the new Police Chief for the City of Oswego. DeCaire will replace Chief Michael Dehm Jr., who is retiring effective May 31. DeCaire is a 13 year veteran of the department. He began his career as a police officer on Jan. 19, 1998. 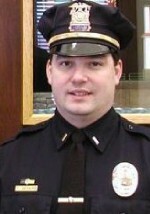 He was promoted to sergeant on March 27, 2004, and on Nov. 27, 2005, he became a lieutenant. Since March 30, 2008, DeCaire has been a captain. He has experience as the Administrative Captain and the Patrol Captain. DeCaire graduated from Oswego High School and has a BA in Public Justice from SUNY Oswego. He is a certified instructor in various police specialty topics, he has successfully completed multiple grant applications resulting in funding for the police department and was instrumental in the Oswego Police Department Re-accreditation in 2008. DeCaire is married to the former Lilly Sweeting and they have one daughter, Sophie. Excellent Choice! Tory will do a great job here IF the council clowns will let him…congrats Tory! I have known Tory for a great many years and can attest to his honesty, integrity and strong work ethic. He was raised by loving parents and married a woman that shares the same characteristics as he. I for one am overjoyed he was picked to be Chief. He is a young energetic man that has earned the respect of many in the community. Congratulations Tory , I am proud to be able to call you Chief!! Say Hello to Lily!! !